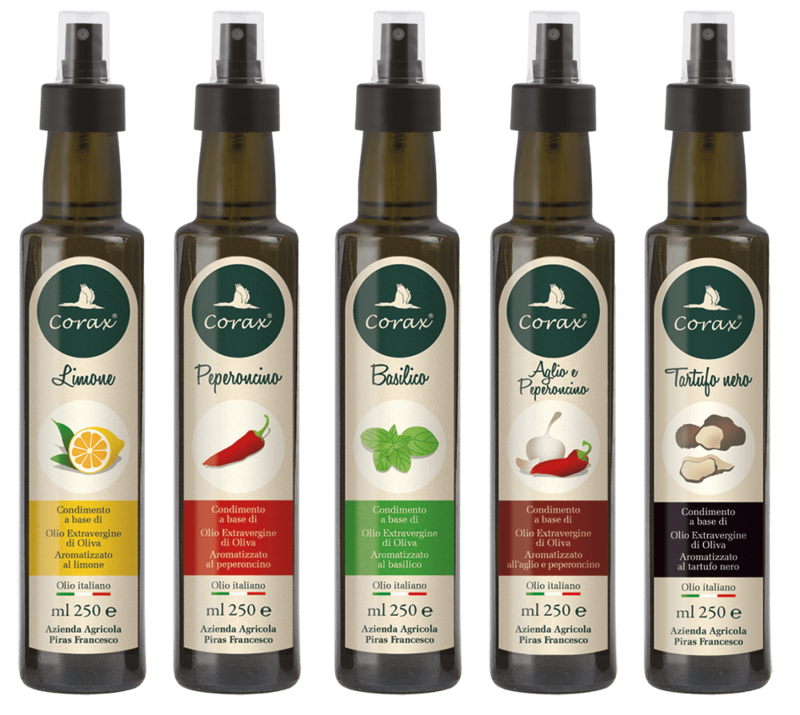 Aromatized - Corax Oil - Francesco Piras Farm Company - Oil Mill in Alghero, Sardinia. Aromatized - Corax Oil - Francesco Piras Farm Company - Oil Mill in Alghero, Sardinia. Chili pepper, excellent for first courses, and legume and beansoups, or on pizza. Garlic and chili pepper, excellent for stir frying and sautèing, and perfect for the famous "garlic and chili-pepper" pasta dish. Basil, ideal for fresh food and summer dishes, or for delicate sauces. Lemon, perfect for adding flavour to fish-based dishes, salads and boiled vegetables. Black truffle, ideal for seasoning home-made first-course dishes.